We are located in the United States so the copper coins listed here will be Non-U.S. origin. 1847-JA. Spain. 8 Maravedis. PCGS. MS-62. BN. 1966. Great Britain. Half Penny. CBU. Original sealed bag with the Crown lead seal and 1966 dated blue tag, 2,400 uncirculated coins total. Great promotional item. 1991. Mexico. 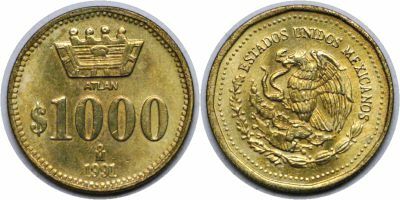 1000 Pesos. CBU.